The Vallée d'Aoste Jambon de Bosse DOP is a spiced ham produced at 1600 mt above the sea level in the town of Saint-Rhémy-en-Bosses, situated in Gran San Bernardo Valley in the Valle d'Aosta region, on the border with Switzerland. 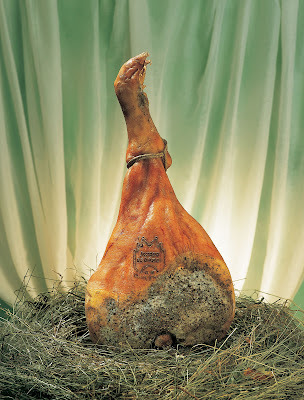 In the production of the Jambon de Bosses can be used only swine breed thights from farms located in the regions of Valle d'Aosta, Piedmont, Lombardy, Veneto and Emilia Romagna. The pork leg, carefully chosen from high quality beef, is dry salted with the add of natural flavors: pepper, sage, rosemary, garlic, juniper, thyme and bay leaves. Any type of additive, including saltpeter, is expressly prohibited by the rules relating to the protection of DOC mark. After the salting process, the leg is massaged to facilitate the escape of the serum and the blood. Then the leg is washed and dried and the exposed surfaces are covered with coarsely ground pepper to prevent oxidation. Finally the ham is repened. Its unique fragrance, delicate and aromatic, its typical spicy taste, its slow and strict production and maturation process, allowed it to obtain, in July 1996 the DOP mark. The Jambon de Bosses best expresses its own nuances if served in very thin slices (preferably hand-cut) and accompained with brown bread, or with butter, honey and walnuts. However, the ideal opportunity to taste this delicacy is the yearly festival held in Saint Rhémy on the second Sunday of July.To come and taste this delicacy in Italy, visit our partner website here.